Liverpool welcome Crystal Palace to Anfield in the Premier League on Saturday afternoon, aiming for another win to cement their place at the top of the table. The Reds bounced back from their loss at Manchester City with a narrow victory at Brighton last time out to retain a four point advantage over Pep Guardiola's outfit in an enthralling title race. Meanwhile, Palace were unable to build momentum on their impressive win at Wolves when they were put to the sword by Watford - to leave them just four points above the bottom three. With both sides battling in contrasting ends of the division, the onus on earning all three points from this encounter is huge. Jurgen Klopp has been ​dealt another defensive blow with the news that Trent Alexander-Arnold will be out for up to four weeks with a knee injury he sustained during Liverpool's 1-0 ​win at ​Brighton. The 20-year-old joins fellow defenders ​Dejan Lovren and Joe Gomez on the sidelines, meaning ​James Milne​r could once again deputise in the back-line. ​Crystal Palace face a goalkeeping crisis with both Wayne Hennessey and Vicente Guaita serious ​doubts for the trip to Anfield. Third-choice stopper Julian Speroni could make his first start for over a year - having last featured in their 3-2 home ​defeat against ​Arsenal in December 2017, whilst striker ​Christian Benteke could return after four months out. ​Crystal Palace ​Speroni; Wan-Bissaka, Tomkins, Sakho, Van-Aanholt; Kouyate, Milivojevic, McArthur, Meyer, Townsend; Zaha. The two sides have met on 53 occasions in all competitions - ​Liverpool recording 28 wins to the Eagles' 14, with 11 ending all square. ​Goals from Milner and ​Sadio Mane brushed aside their opponents to hand the Reds all three points in the corresponding fixture from this season at Selhurst Park back in August. 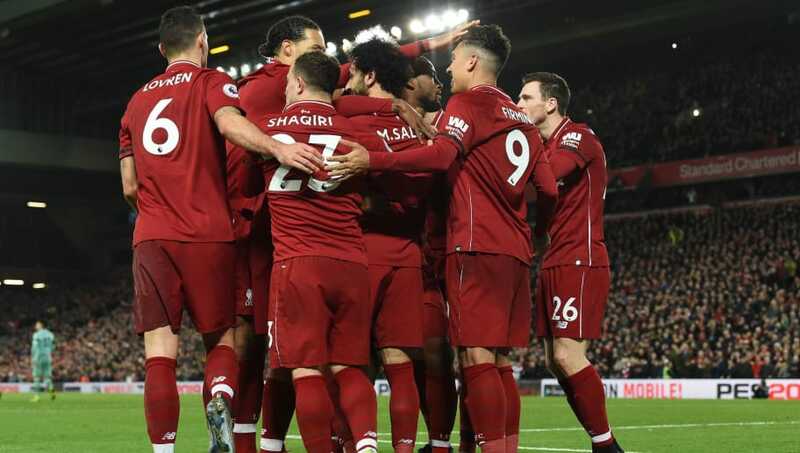 Seeking a first Premier League title in nearly 30 years, Jurgen Klopp's men have blown away several teams on home turf this campaign - conceding just three goals in the process. Despite a slow start, African Footballer of the Year ​Mohamed Salah has replicated last season's formidable form that's seen him be directly involved in 21 of their league goals (14 goals, seven assists), more than any other player. Having netted four in his last five games, keeping the Egyptian fit will be integral if Liverpool are to prevent ​Manchester City from retaining their crown. Despite Palace's lowly position, Hodgson's side have demonstrated that they're no pushovers against the top six. Picking up five points from a possible nine against Arsenal, ​Manchester United and notably City, the Eagles boast the meanest defensive record of any bottom half side. In contrast, goals have been hard to come by - having managed just 20 goals in 22 outings this term. Here's how each team have faired in their last five fixtures. Coupled with the Eagles' inconsistent goal-scoring habits, Liverpool have been breached by just Arsenal, United and Cardiff at home this season, as they seek a ninth win in 10. Palace have ​beaten their illustrious opponents at Anfield as recently as April 2017 in a 2-1 success, but face a considerably tougher test on Saturday. Whilst the outcome of this encounter is a foregone conclusion to many outsiders, Roy Hodgson has transformed this side into an organised and determined outfit. It will be close.